Since 1st March 2009 the Pension Related Deduction (PRD) must be applied to the remuneration of public servants. Who does the Pension Related Deduction apply to? What pay does the Pension Related Deduction apply to? The Pension Related Deduction applies to all Schedule E remuneration covering all elements of gross pay, including overtime, arrears, all taxable allowances, Notional Pay on Benefits and taxable portions of Illness Benefit. Since 1st January 2011 Gross income before the PRD deduction is subject to PRSI. The exemption threshold for 2018 is €28,750. No changes are required to the P45 issued to employees who leave employment from whom a Pension Related Deduction has been deducted, however, a statement of Pension Related Deductions should be issued with the P45 to the employee. Where an employee leaves employment within two years and neither transfers to another public service employment nor retains any pension benefits they are due a refund of both the pension contributions and the Pension Related Deduction. Per the Department of Finance this refund is to be calculated manually outside of the payroll software. 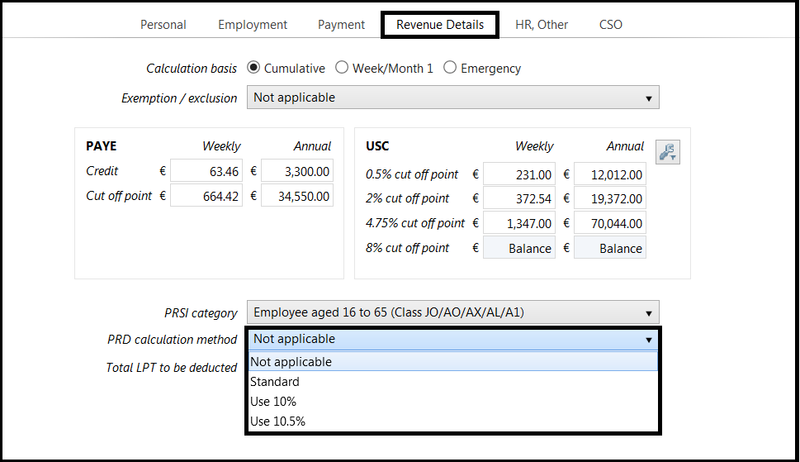 Go to Employees > Select Employee to whom the deduction will apply > Revenue Details > Select the appropriate PRD calculation method. The Pension Related Deduction will display separately on the employee's payslip as "PRD”.